Jude Chiemeka, ex managing director of United Capital Securities Limited and Olumide Bolumole, former ag. managing director of FBNQuest Capital have joined the Nigerian Stock Exchange (NSE), as part of the bourse’s executive management team. The NSE in a statement on Monday said Olumide Bolumole joins NSE as divisional head, listing business while Jude Chiemeka joins as divisional head, trading business. Oscar N. Onyema, chief executive officer of NSE expressed excitement over the appointments and described the appointees as outstanding young business leaders. According to Onyema, their addition to the exchange and the management team is at a time of executing organizational growth and market-wide initiatives. “I look forward to working with Jude and Olumide to continue executing our strategy of becoming the preferred African Exchange hub” said Onyema. The NSE CEO also expressed gratitude to Tony Ibeziako, head, primary markets and Olufemi Onifade, head, secondary markets. According to Onyema, these men led the teams of listing and trading businesses during the transition period. In his remarks, Jude Chiemeka stated: “I am pleased to join NSE during this important stage where the company is evolving into a demutualized Exchange. The Exchange has undergone a lot of transformation and I look forward to working alongside the great teams at the Exchange to accelerate the execution of the company’s strategy and drive greater value for our investors”. Olumide Bolumole expressed similar enthusiasm, by saying: “It is clearly an interesting transformational time at NSE and I am very excited about working with the talented employees and seasoned leadership team to create an even stronger globally competitive market that is the preferred choice of discerning issuers across continents”. A brief profile by the NSE indicates that Jude Chiemeka comes with over 24 years’ experience in securities trading and asset management across markets in Africa. 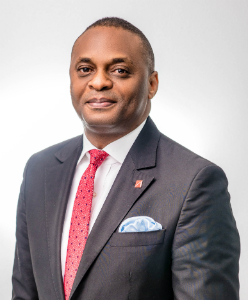 He’s joining NSE from United Capital Securities Limited a subsidiary of United Capital Plc, where he was the MD/CEO. He had previously helmed affairs at leading investment banking firms in Nigeria such as Chapel Hill Denham Securities and Rencap Securities (Nigeria). He is a Fellow of the Chartered Institute of Stockbrokers and an alumnus of University of Lagos, Lagos Business School as well as University of Oxford, UK. The NSE described Olumide Bolumole as a financial market professional with close to two decades of experience in capital markets across; asset management, investment banking and merchant banking. His most recent role was as ag. managing director of FBNQuest Capital from 2018 to 2019. He joined the FBN Holdings Group in 2012 where he headed securities’ sales spanning FBNQuest Capital as well as FBNQuest Merchant Bank. Olumide started his career on the equities trade execution desk at De Putron Fund Management, a Hedge Fund based in the UK. Bolumole also worked at BGL Securities Ltd where he was head of institutional sales. His area of expertise is across asset classes with competencies in trading, business development and distribution. Olumide holds a Bachelors of Engineering degree in Aeronautical Engineering from the City University (London, UK) and a Masters of Information Systems from the University of Sheffield (Sheffield, UK).